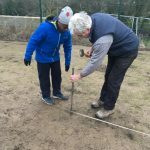 Our New School Garden Lusk S.N.S welcomed heritage expert Ian McGrigor on Friday. As part of the woodlands project, the children on the gardening committee helped Ian to construct a willow fence in the senior yard. It looks amazing!! Well done to all involved.